Halloweenie is almost over. We had some sticky people show up for candy and mum gave out almost all of the candy. Said that is a good thing. I am not a cat who likes to run outside, so mum didn't hide me in the sleepy room. I just chilled and napped. Plus mum saw a black kitty run through our yard this afternoon. In a hurry to get somewhere, he didn't stop to say hello. 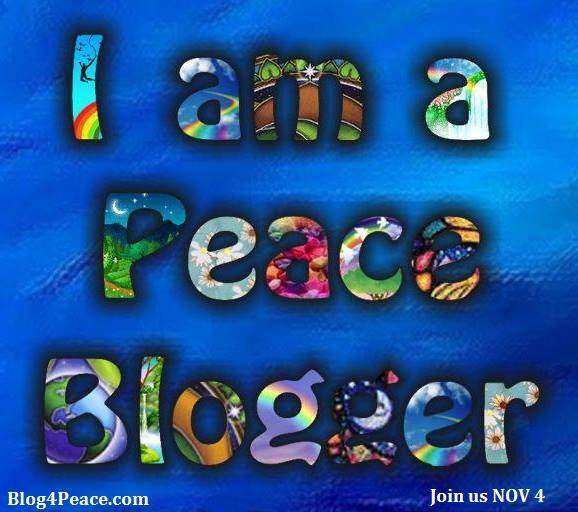 Don't forget on Caturday, it is the blog blast for peace. Mum counted and this will be our 11th year. Gotta keep our streak going. Me and mum sleep together very well. We both have enuf room, and to save room I sometimes sleep on top of her. Don't worry about Caturday, I had lots of cuddles earlier so not like I didn't get any, I just always want more! Mum did me a moovie. She got my jelly fish dangle toy out and I decided to play with it. I had been ignoring it, so she had put it away. I got my nice jelly fish from my sweetie Dora. Quiet weekend. Mum did her chores around the house, readed her book and her garden stuff for class. Sunday was bright and sunny so I had lots of sun puddles to nap in. No feetball report this week. They gave the team a week off to rest and chill. Maybe get the sub QB a bit more work so he is better. Guess it will be a long rest of the season. ARodg had his shoulder screwed back together. Hope everyone had a good weekend and have a wonderful week. Hollow-weenie will be here on Toesday. I will hide in the sleepy room. HiYa Ducky here. Happy Caturday! My day is getting off to a good start, although I couldn't convince mum to crawl back into bed this AM. Said she slept late enuf already! The warms are gone. Last week mum was standing around in nice bright sun and good temps. Today she can stay inside with me and watch the cold clouds move by! At least we haven't seen any snow flakes yet. We don't have sun this AM but when we do, the scardy cat Hollow-weenie cat puts off a funky design on the floor. The little head that is upside down is mum's candy holder. It is ready for the sticky little people to come by next week. Me, this is the best place to be. The heaty thing is working and it blows lovely warm airs under neath me. Wonderful place to nap. If you are looking for me, this is where I will be. The weather has turned. It was super nice up through Caturday, since then, cool, windy, rainy and maybe a bit of frost to come really soon. Mum has started to clear out the deaded plants in the garden. She worked on Friday when it was super nice out. She got two sides of the house done, plus part of the big garden as well. Here is the back of the metal monster all full of stuff. Mum even tossed in one of the mums that is well past its prime blooms. A few of the branches were so long they stuck up near where mum has to sit to drive. But she safely made it to the compost place with all of the stuff. She hopes to get more done today! The spot of the big garden that mum cut down, some weed killer is needed, it is being invaded by something mum doesn't want to grow there. Remember, a weed is something that is growing where you don't want it to grow. This is part of the back, all cleaned out of the plants that gotta go. The snow on the mountains died back and is starting to grow again. Mum doesn't cut it back, it will just get buried with snow. Other side of back cleared out with the exception of one of the butterfly bushes, it was still growing good. So mum will leave it until it gets freezes. That is all of this week. Stay warm. Love, Virginger, Glimmer, Trooper and Fleur. HA! I never know what time to wake up mum. She gets up at all different times depending on what is going on. She even had the noisy box by the bed go off a couple of times this last week. Even on Caturday, she was up and out of the house before the sun came up! So what did she do? One last day with racy cars! She had a beauty-ful day she said. The weather was good, lots of sunshine and she only was gone on Caturday. She was back with me to sleep and she stayed home on Sunday when it rained! A silly graphic on the side mirror, same thing on the other side. Then a pic of mum in the sunshine. Yeah, she had her bright tie-dyed shirt on. The better to be seen! Here is a short video of the cars as they leave where mum and others make sure they are belted in, helmets on and properly clothed with race suits and gloves. So when she got home I sat behind her on the couch so I could soak up some loves. Mum pulled out her crow-shay on Sunday during the feetsball game. Said when she pulled it out that she thought she was farther along. Oh well mum, you have more to do to keep you bizzy while watching feetsball. The Pack - Well Brett is starting the game. No, not Grampa Brett, he is all retired and in the hall of fame. They did score and actually led the game for a while. But the second half they didn't do as much right, so losted. What was nice, which was NOT shown on the moving picture box, was the recognition of the first Stouper Bowl team. This included Bart Starr who looked purrty good for a guy in his 80's and who has had some health issues. He was able to walk out to the field. Last time he had to ride on a golf cart. Happy Caturday everyone. I have been around the Cat Blogosphere yesterday checking out all of the grate tock shots that got posted. I may not have gotten to you yet, but I will try! Mum started working to cut down the outside plants yesterday. It was a nice day and I could help snoopervise from inside. Yes I was snoopervising here! MOL. Mum got out the grass eating on Thursday and cut the grass and chewed up the leaves. On Friday while she was working she noticed these bits of fevvers in the grass. So Mr Hawk got a fevver, likely a smaller one as the pile of left over fevvers wasn't much. Me checking out the smells on mum shoes after she came inside. I like those smells, but later mum decided to take me outside. I did not like it at all. I grabbed the door with my paw, but mum just gently held me. I meowed to her, saying I much prefer to be inside. So then I got to moving around in her arms, so she opened the door and I jumped back inside. I am an inside cat mum. Unlike Derby I doon't want to go outside. I was out maybe a minute, but I still don't like it. One last really nice day here today. More open windows and such. Everyone have a wonderful weekend. 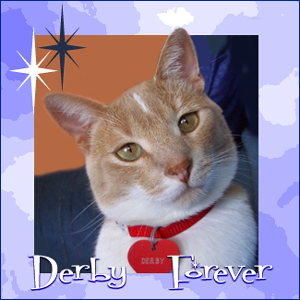 If my late, grate brofur Derby was around he would have been 14 years old today. Sadly he is at The Bridge, an ageless icon for the rest of us. Here he is letting it all hang out. 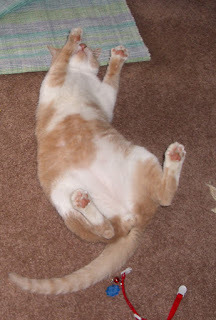 Tocks, toes, spot 13, tummy. I think he was cellybrating that mum took his collar off! MOL! I am hosting a party over at the Tabby Cat Club, so stop by. 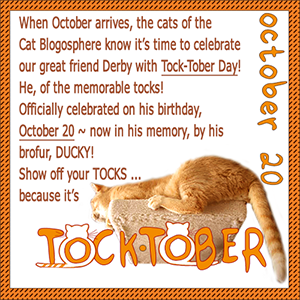 See all the posts of my fellow tabby's tocks and just enjoy the day. Hello and Welcome to Garden Thursday with Virginger, Glimmer, Trooper and Fleur. Plus I thinks this will be posted on time. We are having wonderful weather. Sunny, bright and highs in the 70's, well above normal. So mum is trying to get some outside work done while it is still nice. Even though things are growing mum will likely cut them down. No more blooms, just greens. One of our sedums, looks nice and red. We didn't see any bumbly bees hanging around. That has mum worried that the bees aren't making a good living around here. A wide view of our big garden so you can see that we don't have any more flowers. So mum will start cutting this off. A close up of the trumpet vine, some of the leaves are starting to turn yellow, but with no cold weather they won't drop off soon. Here is a purrty, the rose hips from the climbing rose. They are a little bit of color in what is mostly a green and yellow garden these days. That is it for this week. Love Virginger, Glimmer, Trooper and Fleur. 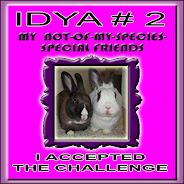 MOL, well we don't have to worry about that, it is only me and mum. We get along just fine! You try moving in on my mum, ya gotta go through me! We had a rainy Caturday. Mum did her one errand, them came home to hang with me. She readed her book, I hung out in her lap and we just had a nice day being inside. The Pack - Well, it wasn't a good day. First they losted to the ViQueens. ARodg landed on his shoulder, broked his collarbone and didn't play for most of the game. Plus they are saying he may not be able to play the rest of the season. Well, me and mum may need to find other things to do on Sunday as watching feetsball won't be fun with no ARodg playing. HiYa Ducky here, Happy Caturday. Looks like it will be a gloomy day. All clouds and rain today. We did see a few minutes of sun yesterday, but it wasn't much. Weather guesser says more sun tomorrow. So me and mum didn't do much yesterday. She was getting something delivered and the email said the guy in the brown shorts would need a signature. Nope. The door bell rang, he put it inside the door and left! Now mum was home, so she brought it in right away. But really! She said not to worry, she didn't have anyplace to get to yesterday anyway. What she did do was to do reading and that is when I invade her lap and let me some loves. I will show you the loves that I get! Yeah, this was nice, all sorts of scritches in all the right places. Did you see my magnificent whisker humps? Do you pick out the whisker that wants to grow in black? Mum got out the Hollow-weenie stuff this past week and brought some new stuff home too. You saw the sign about mum and the monsters. Yeah, some days she is a witch. Mum says she needs to get going. Today she can drop off some old electronics for recycling for free, but she has to drive out close to where she used to day hunt. So she knows exactly where she is going. Everyone have a good weekend. I wish we could send our rain back to Catifornia to help put out those fires. Be safe all of you. Hello and Welcome (FINALLY) to Garden Thursday with Virginger Glimmer, Trooper and Fleur. Yet again mum has let us down for our Garden Thursday post. Get with it lady! Not much to report, we did get some rain, so the grass is looking a bit greener and not so crunchy. Mum has gotten out some of the Hollow-weenie stuff and days this applies to us. So she is the witch and we are the monsters? OK, just watch us be monsters!! HAHAHAHA! So some real garden stuff, the sedums are all nicely turned bright pink now, fall is here, the weather has cooled a bit. Below are the dried flower seeds of the columbines. That is it, late, but we are here. Love Virginger, Glimmer, Trooper and Fleur. Oh yeah, I play attack mum. Then purr. she smiles and gives me pets. Me and mum had a good weekend. She rested up from her bizzy Friday. The green papers that got raised won't be going to us kitties. It is to help peoples who have premature babies. I posed real nice for mum on Caturday AM. So I have that middle distance stare of the super models! Then I got all silly later and showed off my floofy tummeh. You know you want to pet me! FLOOF! The Pack - pulled it out the ARodge and company scoring the winning touchdown with 11 seconds to go. Them Cowboys tried a razzle dazzle play but it didn't work, so pulled victory out of the fire at the last minute. Mum didn't see the whole game, she went off to see a show called Rent. Mum says she got to see enuf and the best part of the game. HiYa Ducky here, Happy Caturday. My day is starting out nice. I had lots of cuddles in the sleepy spot with mum, then she got up and made a lap for me while she readed the newsy paper. All is well. Starting out to be a cloudy day and we had bits of rain which is good. Not much rain lately and the girls showed you how brown the grass looked outside on Thursday. Mum is moving slow today. She was gone all day on Friday to help with the annual charity event at the racy track. Not too hard of work, just make sure seat belts and helmets were on and properly fastened before going on the track. She did catch one sneaky guy trying to take a passenger out that was too young to be out. Good catch mum! So she was all tired and achy when she got home. Hot shower, lots of purrs and sleeps, now she feels better. Oh yeah, they raised nearly 85 thousand dollars as well. Good job! So mum is taking it easy today. Library run, then home to be with me. Happy weekend all. Garden Thursday - LATE Again! It has been nice here, mum had all the windows open so we could chat with Ducky for a while yesterday. Mum was cooking a burger for dinner last night, she got a quick shot of us sitting. You can see the leaves that have dried up and fallen off the trees. Not much color, since it is dry, they just fall off with not much color. Mum even got the grass eater monster out yesterday, mostly to chew up the leaves. You can see that parts of the grass are a bit brown since we haven't had much rain. This is the greenest part of our yard right now. Here is more of the lawn, the drier, browner part. We are supposed to get some rain in the next few days, so maybe things will look with a bit greener next week. We are getting to the end of the hummer season, but mum filled the feeder one last time. We saw our last hummer last week. Mum read to keep the feeders up for two weeks after seeing the last hummer. Mum says we are going to take time today to watch the feeder to see if we see any fevver stop by. Hope you enjoyed the pics. See you next week. Love Virginger, Glimmer, Trooper and Fleur. PS. Late cuz mum picked the wrong date for this to publish. Can't get good help anymore! I knows Hollow-Weenie comes at the end of the month. Mum brought this home from the mayo place and she finally unwrapped it. Said she will get the other goodies out later. Plus she says this new cat has a surprise in it! Mum got home on Caturday in the late afternoon from the funeral. It was in the town she grew up in and she got to see lots of her old grade school furiends. The purrson who died was a mom to one of her furiends. She had a safe trip, a nice day to drive. She was disappointed that the trees didn't have more color in them. Happy Tock-Tober, get your pics ready and post them. Let me know when you do.